People keep power banks to charge their phones on the go or they buy phones with a large battery. Power banks are becoming important in a day to day life. You have to keep the power bank to power your smartphone when the battery is low. In Android, we have various big battery phone, But Apple users struggle with poor battery life. Apple now offers a special iPhone case with built-in battery for those who think iPhone’s battery is not enough for their daily usage. But we still prefer keeping the power bank to avoid any problem. But what if phone and power bank both are discharged and you are at a place where there are no charging points. Solar Power Banks are for these kinds of conditions and they save electricity too. As the name suggests, solar power bank is a battery power bank which is charged from sunlight energy. These kind of power banks are very good for a long journey where your power banks are most likely needed charging too. Solar energy is almost everywhere. So, you do not need to worry. Consider the situation when you are in high mountains and your phone’s battery is dead and you have no camera to capture the beauty of the place. That is why you need a solar power bank for your trekking trips. 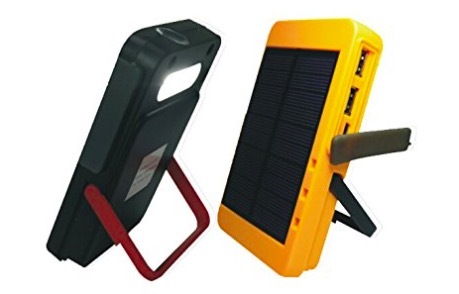 Solar Power banks came in all shapes and sizes. As these power banks are to help you in extreme conditions, most of these power banks are also waterproof and shockproof. These power banks can also hold a charge for weeks. Some solar power banks are quick in charging from sunlight but few take a long time. That’s the difference between cheap and costly solar power banks. In this post, we are listing 5 power banks which can be charged via solar energy. Few of these can also be charged with electrical energy. With solar charging option, you can now go on long trips and your phone will never run out of battery. Note: Every solar power bank recommends the first full charge with a regular power outlet. After that, you are ready to use solar charging. Keep this in mind before taking a solar power bank to a trip. This is the best solar power bank as it comes with 25000 mAh large battery. 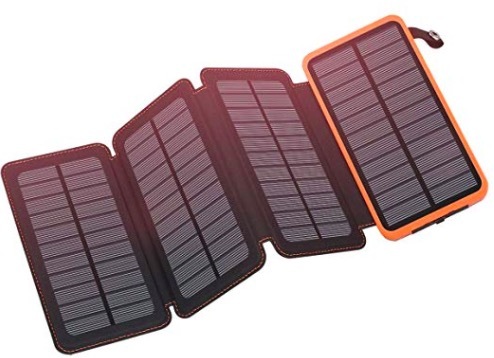 This solar power bank comes with 4 Solar Panels. It is also waterproof. It has two USB ports and can charge two phones at the same time. You can fold solar panels when you are keeping it in the bag. It also has LEDs to notify the charging status. It takes around 25-30 hours in the sun to charge its large battery and you can charge your smartphone multiple times. It is big heavy but you are also getting a large battery. The case of the power bank is made of plastic and synthetic leather. It is Ip65-rated. This one is also a multi-panel solar power bank for outdoors. 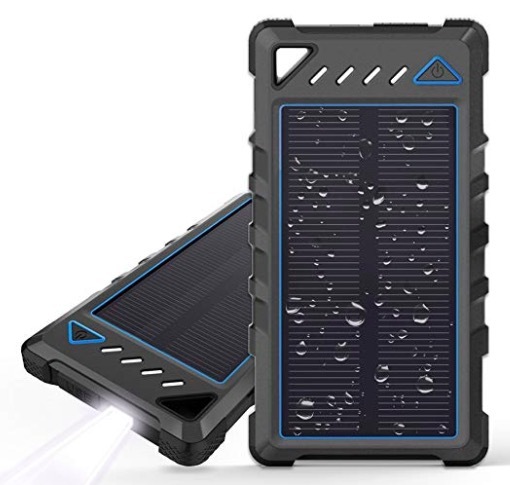 Like other solar power banks, it is also waterproof (IP67). It comes with 240000 mAh battery capacity and can charge your devices on the go. It takes around 30 hours in charge its battery under sun light but the time may be higher depending on the quality of sun light it gets. It iIpX7 rated. The power bank is made of high-quality, plastic and synthetic leather case,. This is a good solar charger designed for rugged conditions. It is compact and waterproof. It also has a LED torch to help in the light. This solar power bank comes with 10000 mAh battery capacity and offers a good conversion rate. It has two USB ports, so it can charge two smartphones at a time. It has a shockproof later to make is shockproof and it can survive in 1-meter water for 30 minutes. If you a trekker, you should surely buy this one. This is also a good solar power bank. It comes with 8000 mAh battery capacity. It also has a torch that is bright enough to work as a reading light. It has 2 USB ports or mobile phone charging. This power bank comes with 6 months of warranty and comes with over charge protection to keep your phones safe. 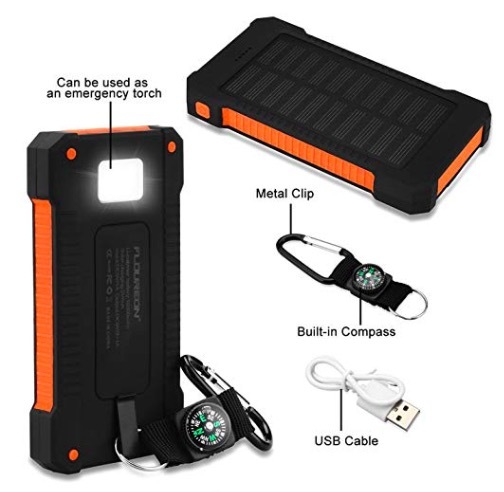 This is another good solar power bank for smartphones. It comes with 10000 mAh battery capacity and has a Compact Solar Panel for charging its battery. It has two output ports, so it can charge two smartphones at a time. One of the two ports offers 10W charging. It also has a LED light for working as a torch. 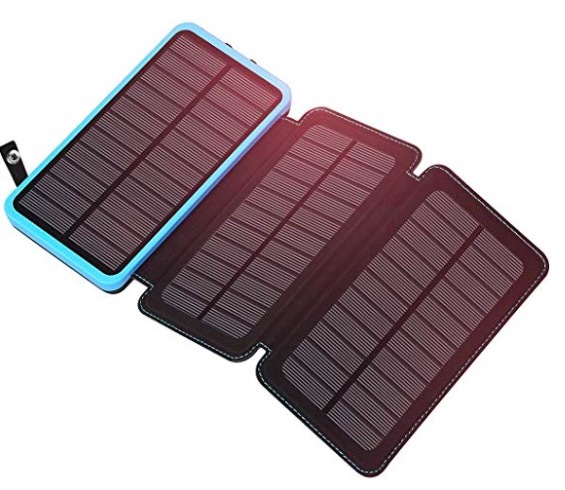 This is the list of some good Solar Power Banks. As a frequent traveler, you should keep a good solar power bank with you. Especially if you go to extreme places for trekking. Solar power banks take a long time to charge than regular power bank that now comes with fast charging, but at least you have support. You can charge your gadgets at no man’s land.